Crafting clear, concise and effective messages focused on customer needs is a crucial skill in every decision-support situation. Tropical cyclones that threaten a coastline have the potential to inflict devastating damage to communities and communicating relevant weather information will assist decision-makers in their plans and preparation work. 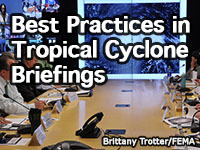 This lesson examines how to effectively prepare for the hurricane season and then focuses on how best to support NWS partners through meteorological briefings during tropical cyclone events. Basic familiarity with probabilistic forecast guidance is required. It is strongly recommended that users review the "Determining the Onset and Risk of Tropical Cyclone Winds," "Forecasting Tropical Cyclone Storm Surge" and "Use of Probabilistic Surge Guidance in Local Storm Surge Forecasting" lessons on MetEd before viewing this lesson. This online lesson is part of the Tropical Cyclone Storm Winds: Forecasting and Communication and Tropical Cyclone Storm Surge: Forecasting and Communication courses. Great details on graphics and presentations. The training is great but what I don't see after taking the quiz are the correct vice incorrect answers. It would be great to know what was answered wrong so that it can be yet another learned lesson as to why something was wrong. actually quite difficult. required a lot of subjective thought. This lesson is outstanding in the area of briefings. I can say after taking this you sure know the ones that need it. Excellent short course explaining principles of a good briefing with examples given. Explain the importance of pre-season coordination. Identify the decision cycle timelines and typical options that are executed by the groups receiving the briefing. Utilize existing NWS graphics appropriately to support your main message. Craft clear, concise and effective messages focused on customer specific needs. Frame the forecast message in the most effective way to enable customers/partners to make the best informed decision possible. Tailor meteorological information according to temporal and spatial resolution needs while appreciating forecast uncertainty - throughout the event timeline of a tropical cyclone (pre-watch, watch, warning, landfall, and post landfall). Coordinate with forecasters in other offices to ensure that a consistent forecast message is created and communicated to the public. This includes coordination between the WFO and Regional/National/International Centers including the NHC, SPC, WPC, and RFCs.